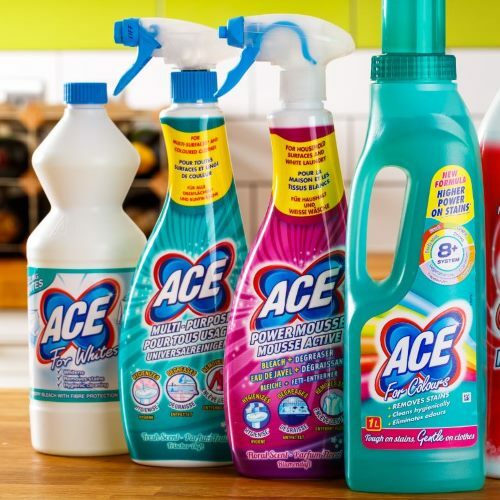 Back towards the end of last year we shared our thoughts on some of the cleaning range from ACE. I had never tried most of the range and was really surprised by how well they worked! We are joining up with ACE again today to giveaway a bundle of products from their range. ACE are always testing and discovering new ways they can be environmental sustainable, with a whole team dedicated to doing just that. When I hear environmentally sustainable I do pause to think if they are compromising on some cleaning power in the process. With concentrated laundry products that work at low temperatures and are versatile to be used in many ways there is no need to compromise. We of course have to start with the original ACE fabric stain remover which is ACE for Colours. With the ACE 8+ system that helps ACE for Colours remove grease, food, trapped dirt, drinks, cosmetics, body soils, vegetable oils and outdoor stains on all fabrics. Another great product in the range for laundry is ACE for Whites, perfect for brightening up all those dull whites in the laundry pile. It has been specially formulated to work on lighter colours while still being gentle on the fabrics, thanks to it's exclusive and patented fibre protection system! When it comes to house hold cleaning ACE have got you covered with ACE Multi-purpose Spray. Containing all the power of ACE for colours in a spray bottle. ACE Multi-purpose Spray allows you to get a precise spray coverage with active foam making it perfect for cleaning all those hard surfaces around the home. When you need some extra cleaning power you can use ACE Power Mousse with it's innovative mousse that allows precise spray with no drips or splashes! Paired with ACE Power Mousse's special formulation of bleach and degreaser the ACE Power Mousse is perfect for the kitchen and bathroom when you just want that little bit of extra power when cleaning. You can purchase ACE for Colours (RRP £2.00), ACE Multi-Purpose Spray (RRP £2.99), ACE Power Mousse (RRP £2.99) ACE for Whites (not currently available online at the time of publishing). Click the links above to visit Ocado and purchase online. ACE products are available at most major supermarkets, Poundland, Superdrug and Savers to name a few. The full list is available on the ACE website. We have two bundles of all 4 ACE products to giveaway to two of you! If you would like to try the ACE range for yourself you can enter using the Gleam widget below. Please read the Terms and Conditions listed below and good luck! There will be two winners who will receive one of each of the four ACE products featured in the above post. ACE is the sponsor of this giveaway and is responsible for prize fulfillment. I love the Ace Gentle Mediterranean Bouquet Laundry Liquid as it smells lovely and does what it promises to do! I love the ACE Multi-Purpose Spray because it can be used all round the house. I love the bleach - it's saved a favourite white top many times. It's got to be the Multi-Purpose Spray; I really like products with multiple uses. The multi-purpose spray sounds good, better than having to use lots of different products. The Ace Multi-Purpose Spray because it can be used everywhere. ACE for whites, whites do not white in our house without ACE for whites. ACE for Whites is my favourite, lovely for my net curtains. Im really interested to try these! Never tried the Ace cleaning brand, would love the chance to try, as a very busy mummy i'm always looking for ways to make my life a little easier. Ace multipurpose spray. Because it is multipurpose. Great for doing a bit of a mad moment clean up! I love their stain remover. Use it all the time. I like the power mousse especially when it comes to cleaning the bathrrom, need all the help I can get! love the look of the Multi-Purpose Spray, great for those little messes! ACE Multi-Purpose Spray so I don't have to carry around lots of different bottles as it can do so much! The stain remover is great and really works! My favourite is the Multi purpose spray because it can be used on so many things. Nothing worse then a mess and your searching for 10 mins looking for the right cleaner. I like the ACE Multi-Purpose Spray, it seems to do a great job at cleaning muck up. I love the multi-purpose spray as it works so well and is very versatile. The power mousse looks great for baths. I've not used Ace before and would love to try it. The Ace for whites is my favourite. I wash all the laundry for holiday cottages and it's great to find a product that keeps all the white towels both soft and keeping them all white after each use. The ACE Multi-Purpose Spray would get used a lot! I haven't used Ace yet. Looks exciting! I actually never used any ACE products before. My favourite is the multi-purpose spray. I like the idea of a product with lots of different uses. I lovethe stain remover it works a treat and much cheaper than other products. Ace for Whites is my favourite! It’s absolutely fantastic for our white bedding & towels, they look as good as new every time! Ace for whites. My white towels need something to make them really white again. Ace for colours - so easy to use and great results. The Ace Multi-Purpose Spray because it can be used all over the place. The the multi purpose spray is the most useful. i don't currently use ace but after all these good reviews i may give it a go. I like the stain remover as it really works to get my kids stains out but is gentle too and smells ok.